[INTRODUCTION] It is seriously important for living donations to make safer and to reduce operating stress. Laparoscopic surgery is though to be a useful operating procedure for solving these problems. We performed first case of living donor (LD) simultaneous pancreas and kidney transplantation (SPKTx) in Japan in 2004, and until now, we have done 13 cases of LD-SPKTx. With donor operation, open traditional approach had been performed for first 8 cases. However, with the last 5 cases, we started hand-assisted laparoscopic (HALS) living donor nephrectomy and distal pancreatectomy for donor benefits. 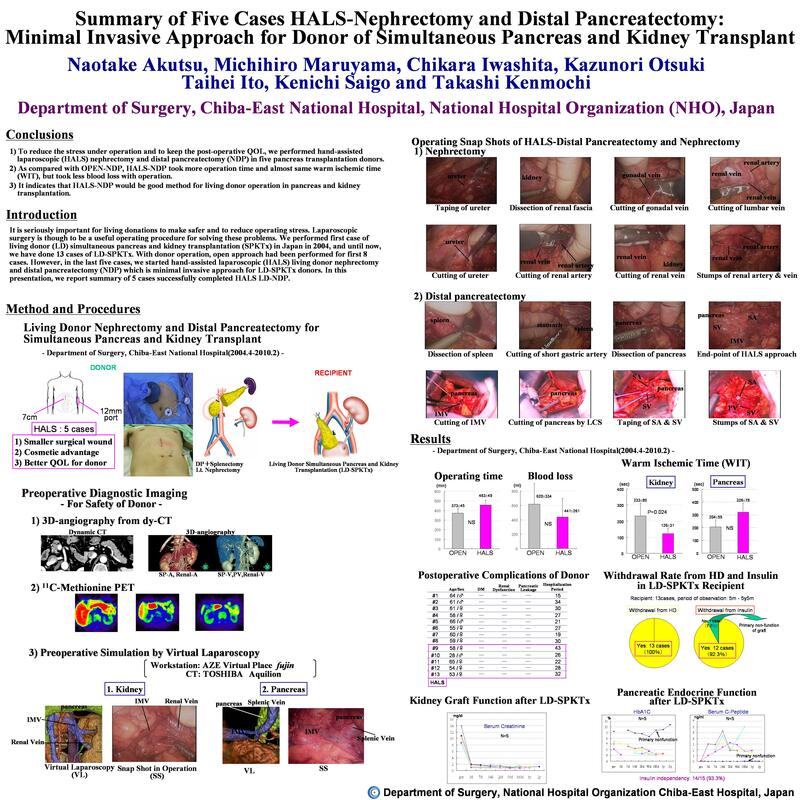 In this presentation, we report the summary of these cases of successfully completed HALS living donor nephrectomy and distal pancreatectomy. [METHOD AND PROCEDURES] In SPKTx donor operation with HALS approach, the patient was placed in the supine position rotated 30 degrees to the right. Placements of working ports were as follows (one hand port (7cm); above umbilicus, three 12mm ports; (left lateral abdomen, left subcostal abdomen and left lower abdomen)). First, with HALS approach, we performed left nephrectomy after dividing ureter with double clipping and finally dividing renal artery and vein by ENDO GIA™ (Covidien). Next, we performed distal pancreatectomy. With HALS approach, we dissected pancreatic tail and spleen from retroperitoneal tissue until finding celiac artery and portal vein. Then we cut the pancreatic body above the left side edge of portal vein with LCS (ETHICON ENDO-SURGERY) through a small window of the hand port incision and harvested pancreas and spleen. [RESULTS] Summary of 5 cases of donor’s background and operation is as follows. Four of donors were women and one was man. Average of age is 43.0±21.2 years old. Averages of their height, weight and body mass index were 160.7±5.8cm (open approach; 160.1±7.6cm), 59.8±4.7 kg (57.6±6.7kg), 23.1±0.9% (22.5±1.9%), respectively. Total operation time was 463±49 (open approach; 373±45) minutes. An estimated blood loss was 441±261 (620±334) ml. A warm ischemia time (WIT) of kidney was 126±31 (233±80) seconds and that of pancreas was 326±78 (204±55) seconds. As compared with open approach, HALS approach took more operation time and WIT of pancreas, but less WIT of kidney and blood loss. Graft functions of kidney were so good that urine was recognized immediately and all recipients obtained withdrawal of hemodialysis. As pancreas function, four recipients got normalizing of blood sugar without insulin, but unfortunately, one recipient had a primary non function. They discharged the hospital without remarkable complications.